When it comes to brand names that will be seen in the Octagon, there might not be any bigger than what will debut at UFC 151 next month. UFC light heavyweight champion Jon ‘Bones’ Jones recently inked a multi-year contract with Nike that will begin immediately as he prepares for his Sept 1 showdown with Dan Henderson in Las Vegas. Jones is the first MMA athlete to ink a worldwide deal with Nike similar to other high profile athletes like LeBron James or Tiger Woods. UFC President Dana White is quick to point out how big Nike’s involvement in MMA is to the overall growth and development of the sport. “It’s huge, it’s really big,” White told MMAWeekly.com following UFC 150. 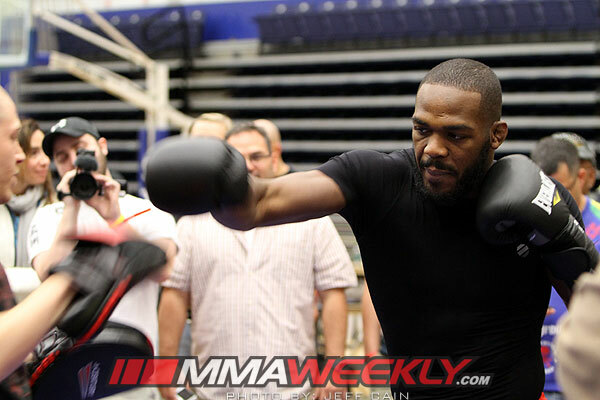 The plan is for Jones to be decked out in Nike gear for his upcoming bout with Henderson, which headlines UFC 151. The endorsement deal is the first of its kind for Nike as they stick their big toe into the waters of mixed martial arts while supporting Jon Jones in this new endeavor. While the two situations may not have anything to do with one another, White points out that Nike has decided to drop their endorsement deal with boxing star Manny Pacquiao as they begin their new relationship with Jones. Jones’ deal with Nike will include a clothing line as well as a signature shoe that will be produced in the coming months. Look for Jones to debut at least some of the gear when he hits the Octagon on Sept 1. Nike PR has informed MMAWeekly.com as of Monday that they have not severed ties with Manny Pacquiao and he remains a sponsored athlete under their name and brand. Pacquiao’s products remain available on Nike’s website and through other various apparel outlets as well.